"How is he contained in a womb, whom nothing can contain?" Below is a beautiful prayer, written by St. Paisios the Athonite (+1994), for monastics to pray every evening on behalf of the world. This is meaningful because it underlines that the purpose of monasticism is not for monks or nuns to solely pray for themselves, but demonstrates to laypeople that their goal is to pray for and support the whole world. This also illustrates the great love that the Elder had and continues to have for all those who suffer from any trial or temptation throughout the world. He helped many multitudes of people on a daily basis through his prayer and instructions, and helps even more after his repose. Finally, as mentioned in the short introduction that I have also translated below, this could definitely be a suitable prayer for laypeople to say on a daily basis, helping us to entreat Christ on behalf of the whole world. The love of Elder Paisios for the whole world is well-known. The Elder has helped a multitude of people, both before and after his repose. From where did he receive the power to strengthen people, and to work miracles? From his fervent prayer to God. The following prayer was given to a women's monastery which had asked him for some "typikon" for their vigils in their cells. This is from one of the last years of his life. In this can chiefly found his love for the whole world. This can be used by each of the faithful, as it covers all cases of people who have need of prayer. Even children can understand it, and it is written in simple words, and thus can be read during the family's evening prayer. Do not abandon Your servants who live far away from the Church. May Your love work to bring everyone near You. Your servants who are suffering from spiritual disabilities. Remember our rulers, and help them to govern in a Christian manner. Troubled families and divorced couples. Remember, O Lord, the orphans of the whole world, all those who are pained and unjustly treated in this life, and all those who have lost their spouses. Remember, O Lord, all those in prison, anarchists, drug addicts, murders, evil-doers, thieves, and enlighten them and help them to be corrected. All those who travel by sea, land, and air, and protect them. Remember our Church, the Fathers (Clerics) of the Church and the Faithful. Remember, O Lord, all Monastic Brotherhoods, men and women, Elders and Eldresses, and all brotherhoods and Athonite Fathers. All those who are like endangered little birds. Remember Your servants who have left their homes and their work and are suffering. Remember, O Lord, the poor, the homeless, and refugees. Remember, O Lord, all nations, and have them in Your arms, protecting them with Your Holy Protection, and keeping them from every evil and from war. And our beloved Greece***, keep in Your arms day and night, and protect it with Your Protection, keeping it from every evil and from war. Remember, O Lord, the suffering, abandoned, wronged, and tested families, and richly give them Your mercy. Remember Your servants who are suffering from spiritual and bodily problems of all nature. Remember all those who are in despair, and help and give peace to them. Remember, O Lord, Your servants who have asked of our prayers. Remember, O Lord, all those who have reposed from all ages, and grant them repose. ***I do not believe it would be impious to also include a special prayer for your country or place of origin. I post this to inform everyone of this blessing to be able to venerate a portion of the gifts which the Magi offered to Christ. 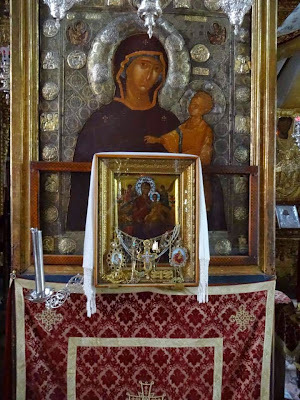 This is especially pertinent for women, children, and all those who may be unable to visit Mount Athos, because it is rare that such treasures of Orthodoxy leave the Holy Mountain. 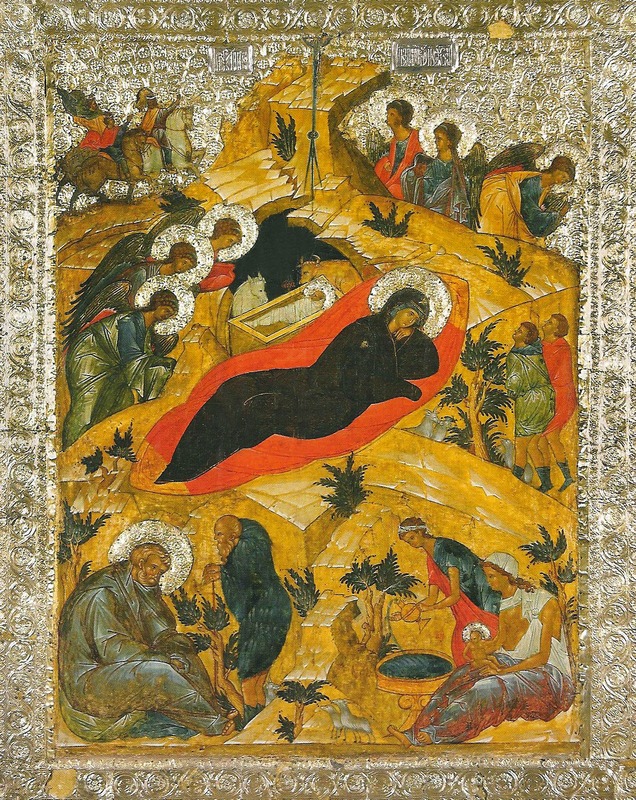 This coming December, the Precious Gifts, which were brought during the nativity of Christ and which are preserved in the Holy Monastery of St. Paul on Mount athos, will be brought to the island of Rhodes [Greece]. 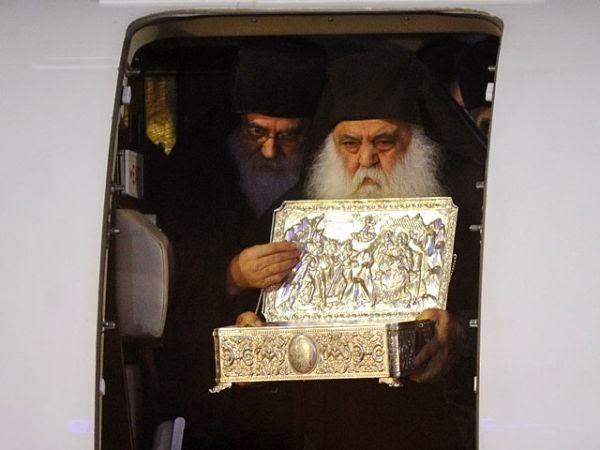 The request for the visit of the Precious Gifts to Rhodes was undertaken by his Eminence, Metropolitan Kyrillos, and took place in order to give the faithful the opportunity to venerate them a few days before the great feast of the nativity of the God-Man. 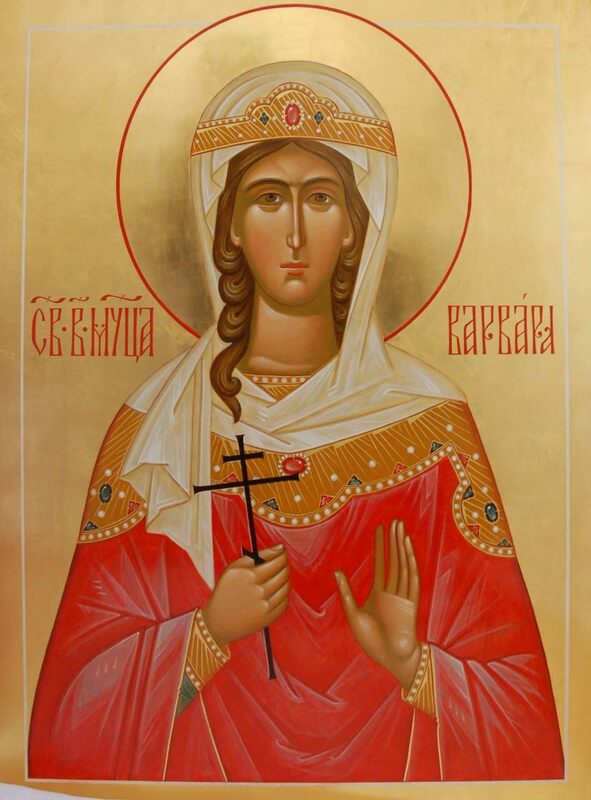 Also note that Precious Gifts will be present in Veria (Beroia) (Northern Greece, close to Thessaloniki) from December 16th to December 21st for veneration in the Metropolis Church. 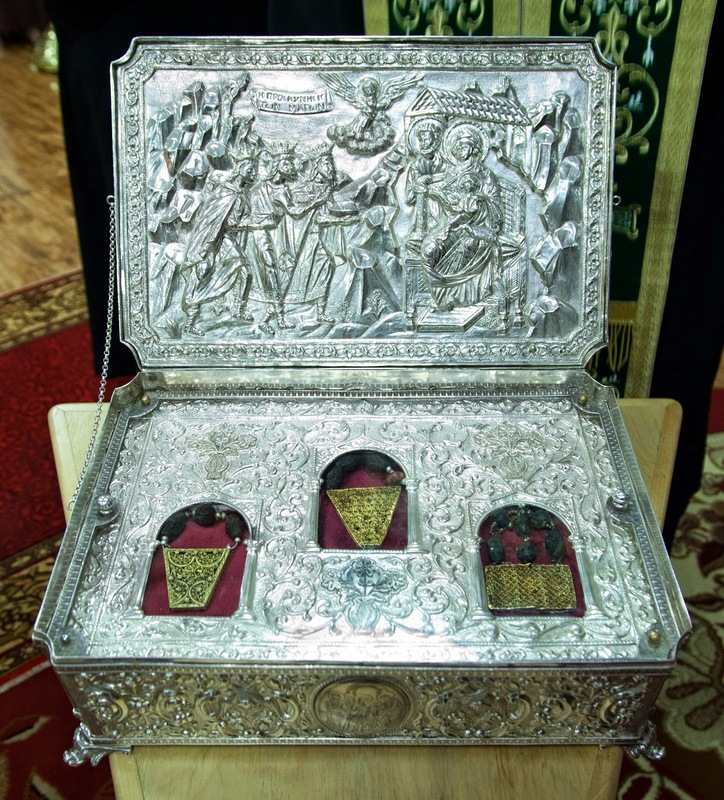 A portion of the Holy Gifts which the Magi offered to Christ at His Nativity: Gold, Frankincense and Myrrh. They are currently treasured by the Holy Monastery of St. Paul on Mount Athos. For more information on them, see here. 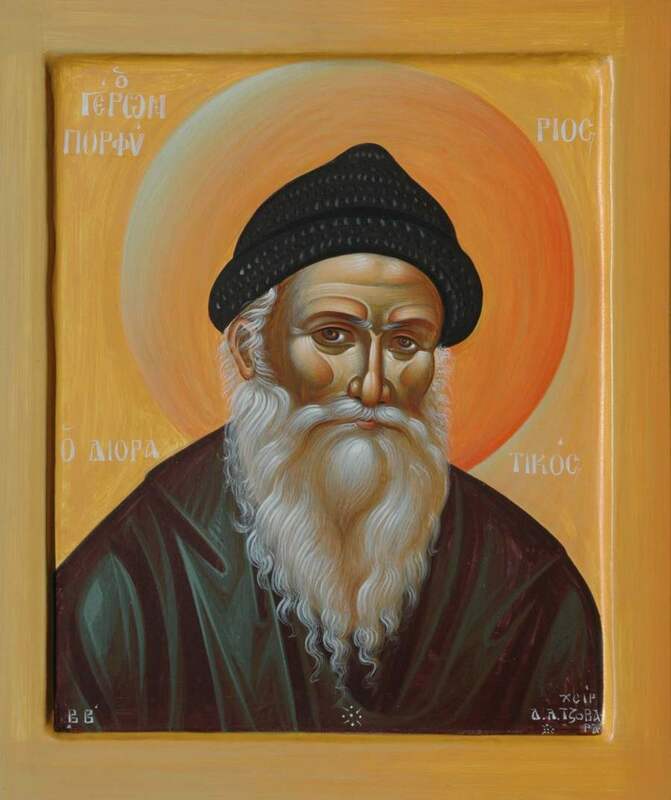 St.Tikhon of Zadonsk: "For whose sake did Christ come into the world? For the sake of sinners." O poor sinner, awaken and come to your senses. If you do not, the very Blood of Christ shed for your sake will cry out against you for retribution. Listen to what the prophet of God sings to you in the person of God, "I will reprove thee, and bring thy sins before thy face" (LXX-Ps. 49:21 [KJV-Ps. 50:21]); that is, all your evil deeds, words, thoughts, intentions and undertakings will follow you into the next world and will appear at the universal Judgment of Christ, and you shall receive your just reward for them. You do not wish now to repent to your benefit, and so be saved by the grace of Christ; then you shall repent, but too late and in vain. "Awake thou that sleepest, and arise from the dead, and Christ shall give thee light" (Eph. 5:14). Blessed be God above all forever. There was a couple in Constantinople who had always had a special love for Saint Nicholas. Each feast day they celebrated with special food, wine, holy bread, and candles. Now that they were old, and no longer able to work, they were very poor. The man asked his wife how they could get money to buy what was needed. She took an old carpet, saying, "Here is our last posession. Sell it and then buy all we need to show our gratitude to God and Saint Nicholas." The old man took the rug and set off to the marketplace. Arriving at the market, a distinguised looking nobleman asked how much the rug cost. The man told him what it cost when new, saying he'd take whatever he could get for it. The nobleman gave him six gold pieces—much more than the man expected—took the rug and left. People near the man were puzzled as he seemed to be talking to himself. After purchasing the needed items, the man headed home. Meanwhile, back at the house, a distinguished looking man approached the woman, "Take this rug. Your husband is an old friend of mine and I met him at the marketplace today." And he gave her the carpet. When the man returned, his wife accused him of not selling the carpet, "How could you break your promise and not sell this rug?" "Who gave the rug to you?" he asked. She described the man, and he realized it was the same person who'd bought the rug. The man, realizing it must have been a miracle, exclaimed, "The Lord liveth! 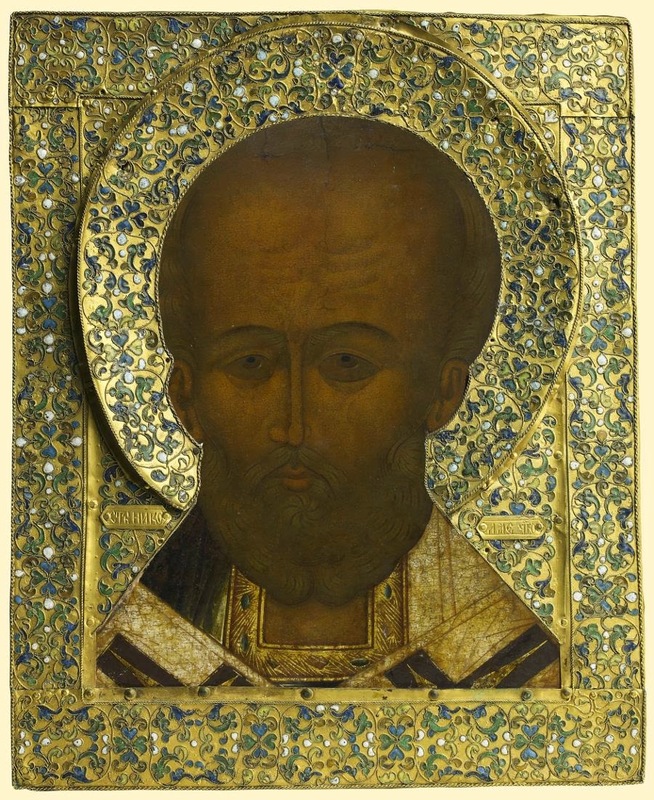 The man who bought the carpet from me and brought it back to our poor home, is indeed St. Nicholas, for a man saw me talking to him and asked if I saw an apparition, for the saint was invisible." He showed his wife what he'd bought—food, wine, holy bread, candles—and the left-over money. Rejoicing, they hurried to the church of St. Nicholas to tell the Patriarch all that had happened. After hearing the story, the Patriarch gave the couple a generous life pension. 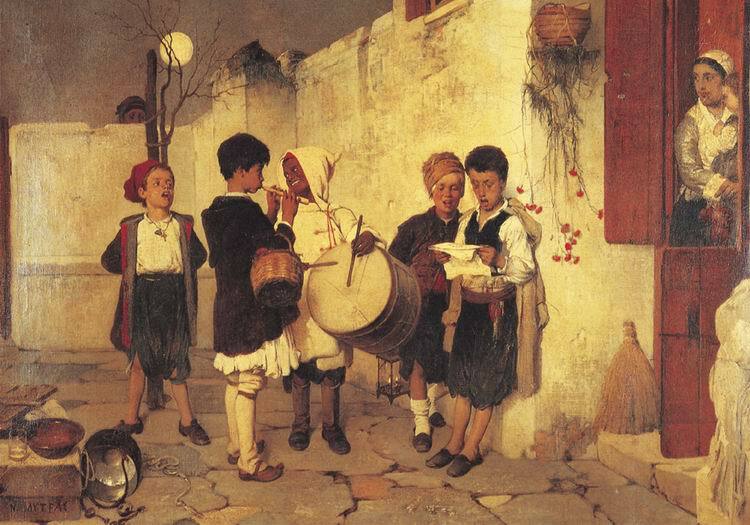 They returned home for a fine St. Nicholas feast with hymn singing and prayers of thanksgiving. 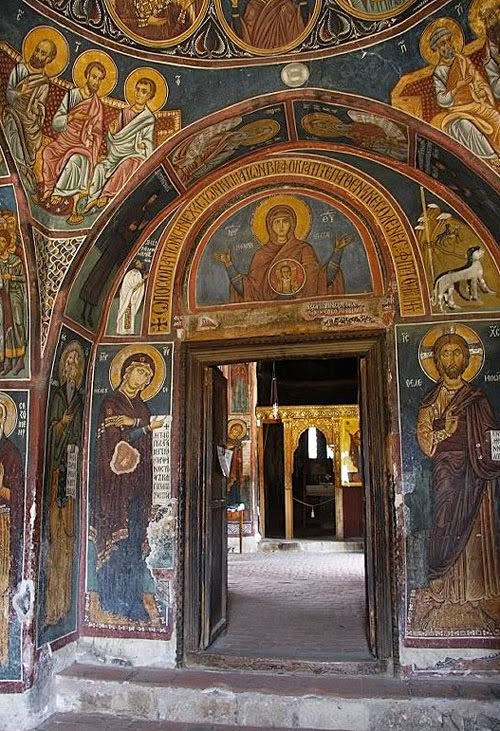 Once we visited the Monastery of Vella, and entered an old church with frescoes. We were amazed at them, while [St. Porphyrios] disappeared into the holy altar. I was by myself in the one aisle, and the rest in the other. In a short time I sensed a fragrance...The church was old and did not function anymore. As time passed, the fragrance got stronger. I looked around. I noticed that it was the strongest towards the holy altar. "Ah, I understand," I thought, "The Elder lit a charcoal and put on some incense." When he exited the altar, I told him unprompted: "That charcoal you lit, Elder, it smells very beautiful." He looked at me with a strange smile. "No," he told me, "I didn't light anything!" Later, he told us: "When I enter the altar of a church, however, I pray. And I sense all of the prayers that had occurred there. This happened a short time ago in the altar. I prayed, and A. sensed it. Don't we say that prayer rises to God like incense?" At St. Ierotheos I experienced the same thing. There, as soon as we exited the church with the Elder and got in the car and drove away from the church, there came a wave of fragrance. The Elder said with a smile, without anyone asking him: "This was a special blessing of the Saint." “In the spring of 1985,” relates Abbess Theodosia of the Holy Monastery of Saints Theodore, Kalavryta, “I was at our monastery, and one night around 2:30AM I heard outside the window of my cell, in the monastery courtyard, that someone was digging. To confirm this, I blew out the light in my cell, and I looked out the window. I saw the flashes of a flashlight. Then I prayed to our wonderworking Saints to protect us. I checked the windows and secured the doors to the courtyard of the deserted monastery, so that no one would be able to enter, and as I confirmed that the area was silent, I returned to my cell. I remained on the phone, without speaking due to my astonishment, because he spoke to me about real events. It should be noted that there are truly two caves, but we had not seen the second cave until we were in the monastery for over a year. The shepherds of the area had told us that there was a second cave. From the book: Elder Porphyrios, the Spiritual Father and Teacher. Amateur translation of text from source. The rose does not speak, but puts forth a strong fragrance. We too, should put forth fragrance, pour forth spiritual fragrance, the fragrance of Christ. The fragrance of our deeds should be heard from far around: good, pure, and righteous deeds, full of love. Only thus can the Kingdom of God appear within our hearts, appearing not through words, but with power. Amen. "Fasting is a commandment of God. Because of this, we should also fast, my children. I have not neglected fasting in my 70 years. My mother taught me fasting from childhood. I am not being a hypocrite, my children, when I fast, but I am doing that which my parents taught me and that which I keep until today, my children. Fasting has never brought sickness upon me. Physicians and Bishops say that frugal fasting is very beneficial to man. Once, a doctor told me: "Father, don't eat for five days, nor even drink a drop of water, because we will do a test to see what is going on with your body." Therefore I fasted for five days. It had done great things to me. How much more are we benefited when we fast for our soul! Because within our body inhabits an eternal soul. Therefore, let us take care for our soul, which is truly an immortal thing. Let us fast, my children, do not listen to those who say that fasting is nothing, and that this is something from monks. This is not from monks, my children, forgive me, God says this. The first commandment of God is fasting, and our Christ fasted. We can say that we are fasting, and eat so much. Now, what fasting are we doing, my children? When we eat, forgive me, so much food, even if it is without oil. It is sufficient that man have his health and the desire to fast. Once, someone came to me and said: "My priest, they told me that fasting doesn't exist." "And who told you that there was no fasting? Go tell the Priest to open the Bible and see that which discusses fasting: 'without prayer and fasting' (Matthew 17:21, Mark 9:29), which our Christ says, and other things.' And the demons, and sicknesses, and all the passions are cast out with fasting. The Holy Forerunner, what did he eat in the desert? What did the Venerable David eat? With an antidoron, he passed the whole week in his cell of asceticism." 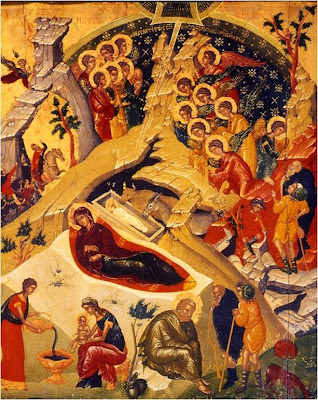 A Byzantine Christmas Carol: "The Beginningless God descended..."
As we are beginning the Advent season, I pray that this may be a time when we might all draw closer to the Lord, Who is coming to save us. I came across this Byzantine Christmas carol, originally from Pontos of Asia Minor, "Anarchos Theos Kataveviken" ("The Beginningless God descended..."), and I thought to share a translation of such a beautiful and theological and moving carol (sung with Byzantine chant and instruments, but not at all used liturgically). 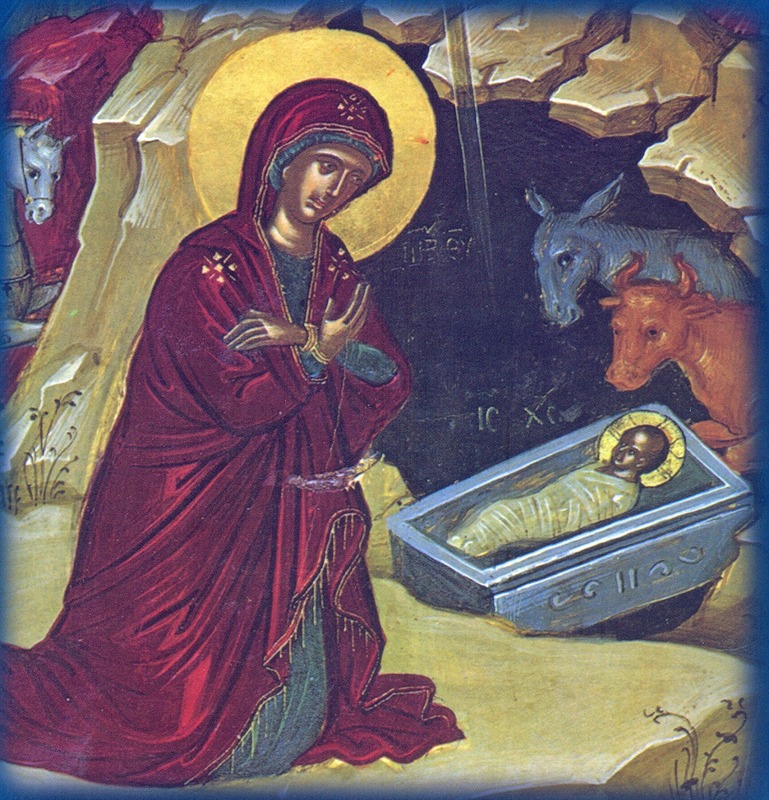 May the Lord, Who is coming to be born in the flesh for our salvation, have mercy on us all and save us! Ω Παρθενομήτορ και Δέσποινα, σώζε του εις Σε καταφεύγοντας. The Beginningless God descended, and dwelt in the Virgin. Erouem, erouem, erou erou erouem. The King and Lord of all, came to refashion Adam. O men of earth, dance and rejoice, and you ranks of the Angels be glad. 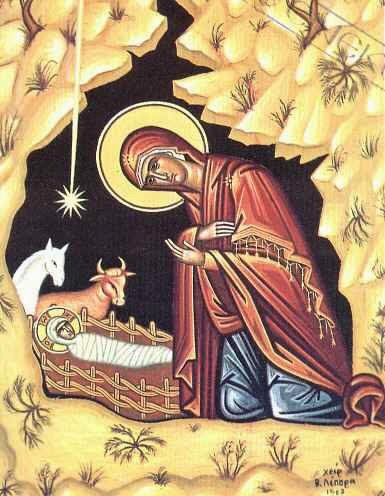 Receive, O Bethlehem, your Master, the King and Lord of all. Magi are coming from the east, to offer Him worthy gifts. They seek to worship the Lord, Who is born in the cave. 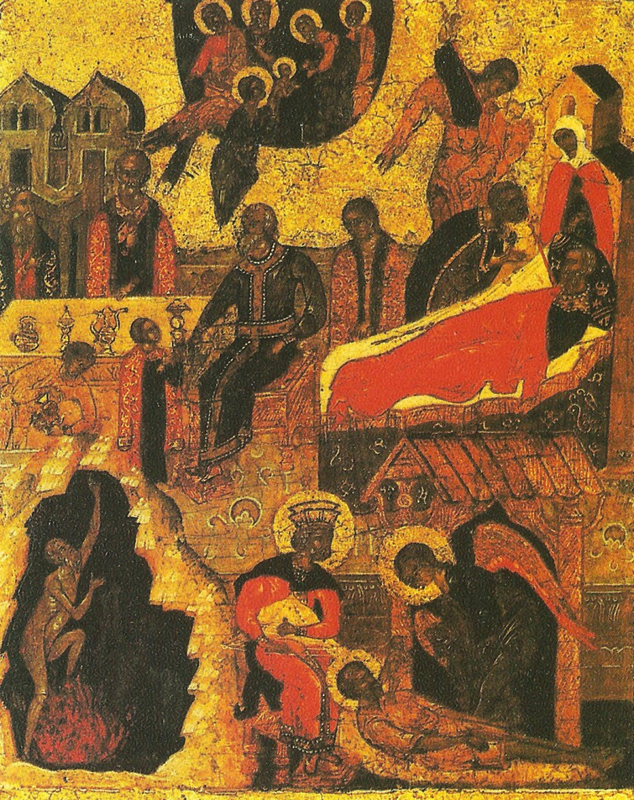 God, the King before the ages, is carried within the cave. Behold, Herod having learned of this, was utterly astonished, the wretched man. O great and awesome wonder, for He Who is in the heavens, departs them. At night, Joseph heard the angel of the Lord speak. O strange and paradoxical hearing, and unspeakable condescension. He Who is forbearing and compassionate, endures the offenses of all. Again, the heavens are opened, and angels hymn Him. Rhetors have come, and fell down before the great and glorious King. Today, creation exalts and celebrates and rejoices. The ranks of the angels are astonished at the paradoxical sight. Hymns and entreaties they offer to the Master and Ruler of all. A Light has dawned in the cave, enlightening those in darkness. Nature rejoices and exalts, and celebrates and is glad. Let us chant unto Christ our God, Who is born in the cave. 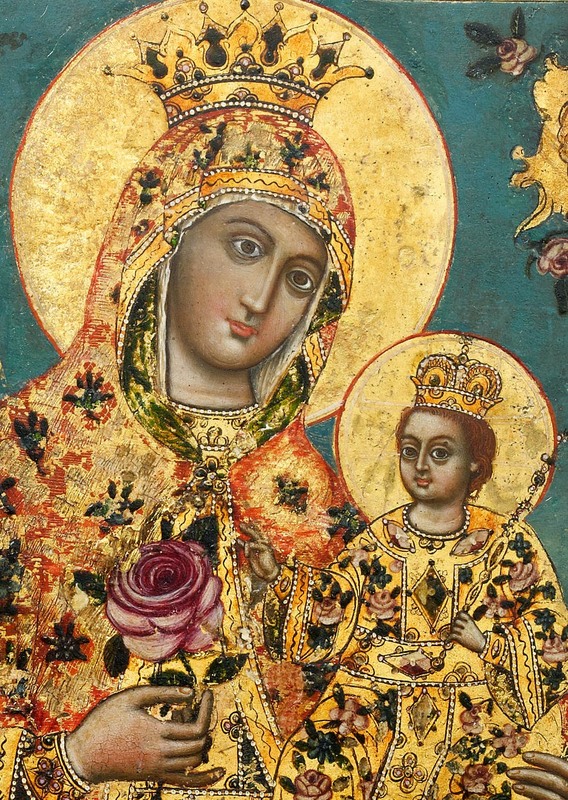 O Virgin-Mother and Lady, save those who have taken refuge in you. Mr. K.P. 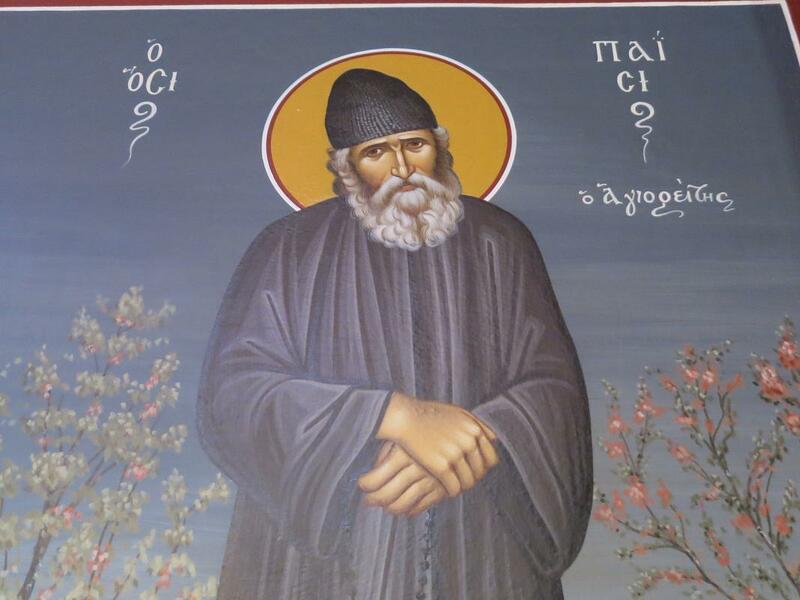 had gone to the Holy Mountain, and was shown hospitality by the fathers of the Holy and Great Monastery of Vatopedi. On October 26th 2014, he asked the fathers there if he could go to confession. The fathers told him that the next day, which was Monday morning, he could go. 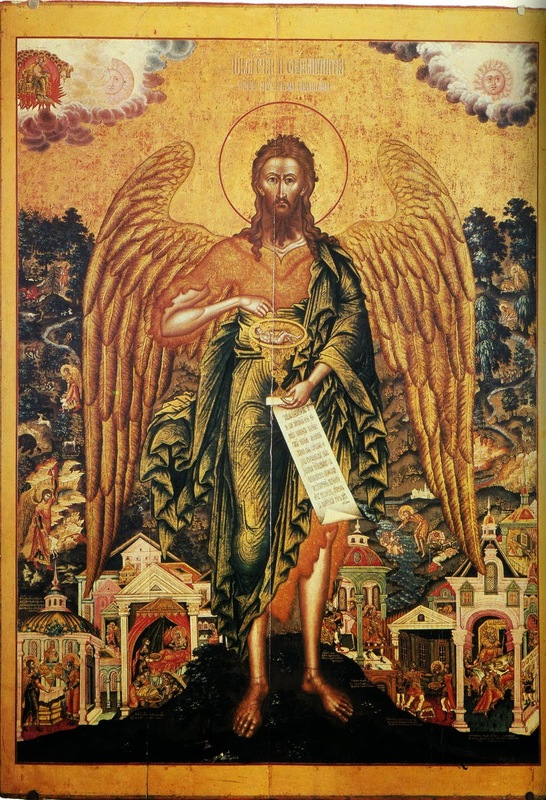 On October 27th, 2014, at 4AM, the Orthros service began, and he went down to the Church, and having venerated the icons, went and sat down. The church had many people in it, and at the stall where he went, he sat next to one man, but the other side was empty. He waited patiently, but the time was passing, and the monk had not appeared who would have led him to the confessor. Around 4:20AM, he turns around, and sees next to him, in the formerly empty stall, a nun! The nun approached him and said: "Wait, everything will go well, you will confess. Don't worry, just wait a little." He thought that most likely, the large monasteries had some nun there to help in the church. A short time passed, and the impatient man thought that he would leave to find someone to take him to confession. It was around 4:45AM when he planned to leave. He took a step, and again he saw the nun approach him, grab him by the shoulder, and lightly turn him back towards his stall. And she told him: "I told you to be patient and wait...Now the Six Psalms are finishing, and the monk will come to take you to the confessor for you to confess." "It's good that you had that nun there to strengthen me to be patient and wait..."
"What nun are you talking about, blessed one? There are no nuns here. This is the Holy Mountain, women and nuns aren't allowed!" "But, I spoke with her twice!" The spiritual father replied: "You spoke with our Panagia, but you didn't realize it, my child!" Then the confessor asked him to describe her. K.P. said: "She was tall, around 30-35 years of age, and very beautiful!" "And what are you looking for regarding prayer, like a recipe to prepare food or medicine? I told you to only seek the salvation of your soul. In other words, you should try to become an inheritor of the eternal Kingdom of the Heavens. And everything else you should leave to the judgment of God. I remind you, again, to "seek first the Kingdom of the Heavens." Is this not enough for you? If this is not enough for you, or if you are not satisfied completely, restrict yourself to noetic prayer. For me, the "Lord Jesus Christ, have mercy on me", says everything. And whatever else from that which you are saying. It is enough to say it with faith and determination. Why do you separate yourself from the rest of the world? This is not at all correct. When we love ourselves, thus we must love our neighbor. I love the whole world as myself. Because of this, I see no reason to say: "Lord Jesus Christ, have mercy on us" and not "have mercy on me". Because the world and I are one and the same! Thus you say: "have mercy on me". 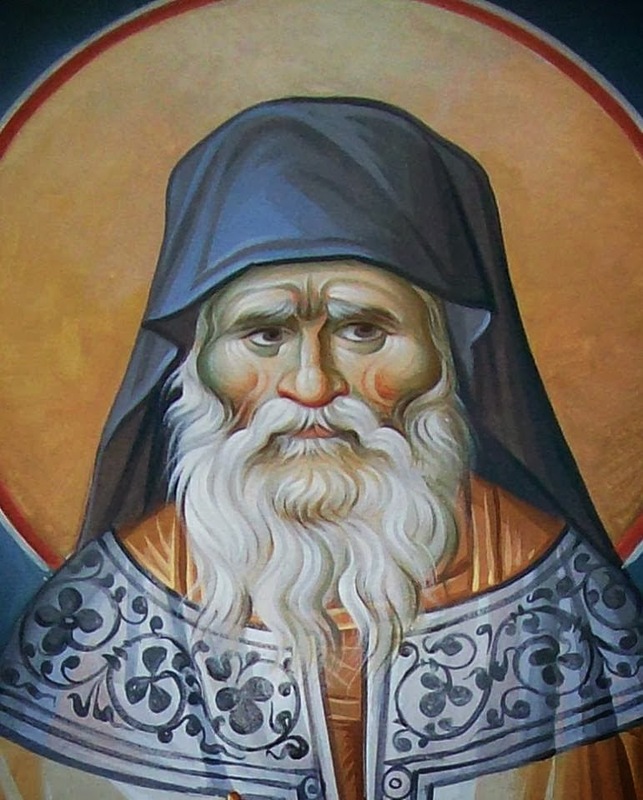 A Poem of St. Nektarios the Wonderworker: "O Divine Love"
And from every stain, O cleanse me. Fervently I entreat you, to grant to me, Your servant. Your Divine Law, O sweet Love. You are the law of the earthly. The eros of the Divine and rejoicing. On the feast of St. George Karslides in Drama (11/4/14), was found the Metropolitan Benediktos of Philadelphia as a pious pilgrim. His Eminence wished to thank the celebrating Saint from his heart for the miracle that he worked for him recently. According to information from Romfea.gr, a short time ago, there appeared a serious problem with his vocal cords. He made numerous visits to special physicians, without finding the cause of his problem or more importantly giving him healing. When, at the suggestion of the Abbess of the Holy Monastery (of the Ascension of Christ, Sipsa), Gerontissa Porphyria, he drank some holy water from the grace-flowing relics of St. George, and after prayer, his throat was healed. 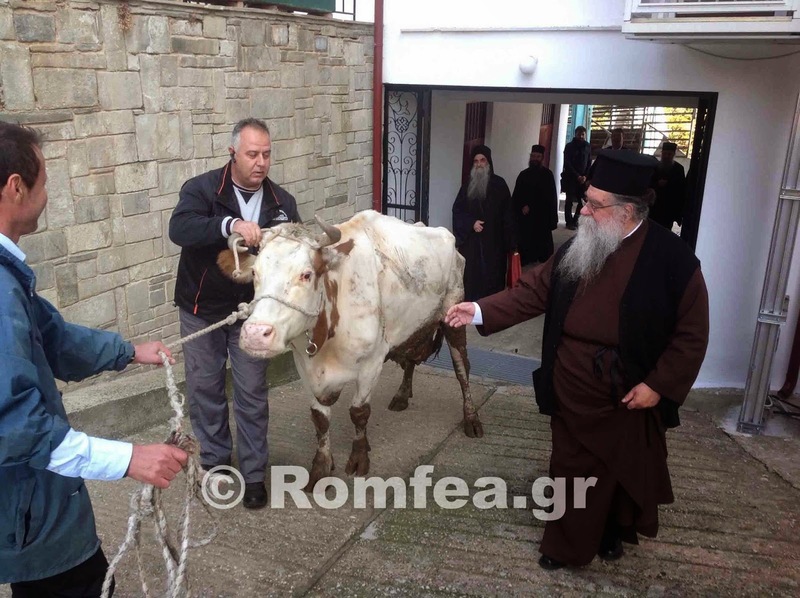 As a sign of thanksgiving for the Saint's miracle, he vowed to take a cow to his monastery, on his feast. The fulfillment of his vow occurred on November 4th, 2014, and the pictures are incontrovertible. It should be noted that the Metropolitan of Philadelphia was granted hospitality like Abraham by the local Metropolitan Paul of Dramas, who had been his friend for many years. 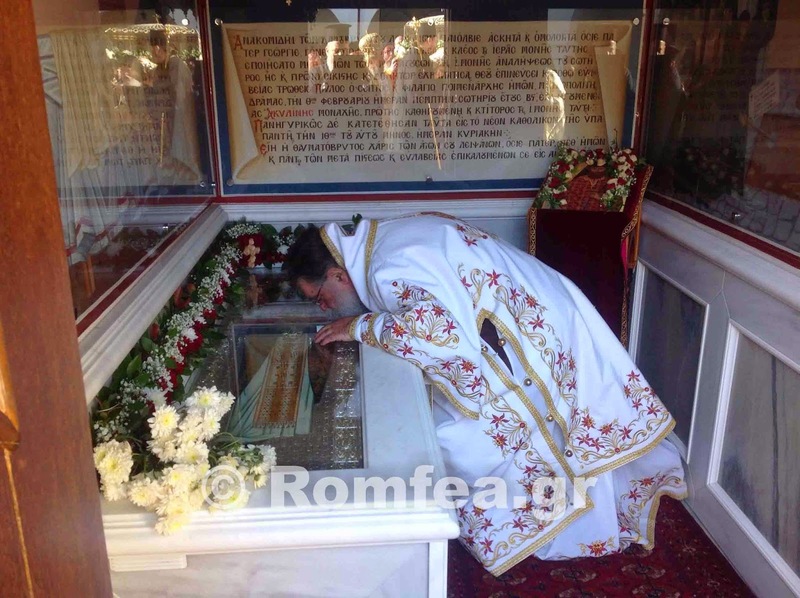 This is a live video of the 2014 service of the Myrrh of St. Demetrios in the Church where his holy relics are treasured by the city of Thessaloniki. This service, which is the ninth day after his holy feast day (October 26th), serves several purposes. One, this serves as an "Apodosis" or Leave-taking of the Saint's feast, which began one week before his feast, with the so-called "Holy Week" of St. Demetrios. Second, there is an official service, calling upon the Holy Spirit to bless this myrrh, granting it the power to heal the infirmities of body and soul. And finally, it is an opportunity for the clergy and the faithful to open the reliquary of the Saint and gather the fragrant myrrh which still wondrously exudes from the Saint's Relics to this day. As the Metropolitan of Thessaloniki chants at the end of the service: "Who is so great a God as our God? You are the God Who alone works wonders!" May we have the Saint's intercessions and protection, especially for all those who suffer or are in danger throughout the world! Amen! Many things, my beloved, make man afraid. But that which frightens him more than anything is death. Even the word “death” alone brings trembling. Death is a great mystery! Everyone, more or less, has the question: what happens after death? Is there anything beyond the tomb, or does life end there, and man is extinguished? The question is an important one. If we believed that life ends in the tomb, then man would be free to do whatever he wishes: to sin, to fornicate, to commit adultery, to break the greatest rules, as long as he evades the eyes of the police and justice. If, however, there is life beyond the tomb, then man must count how he lives in this life, according to the voice of his conscience and the will of God. To the question as to what is there after death, the answer is given us by today’s Gospel, the beautiful Parable of the Rich Man and Lazarus, which you just heard. What does it tell us? There was a rich man, who had all of the good things from God. But all of these (houses, fields, everything else), he used for himself alone. He was a selfish self-seeker, and a worshipper of the flesh. He had the best clothes, wore expensive outfits, which only kings would wear, and ate the best food and drank the best wine, and spend his days in his great home. There were people playing music every night there, and sinful women danced unethical dances. Thus he spent his life, “rejoicing radiantly every day” (Luke 16:19). He did not give meaning to anything else. At his door lay Lazarus, a poor and sick man, alone and abandoned, whom no one gave even the shelter of a roof, or medicine, or any other human help. The rich man never opened his door to show him hospitality, and he tried to survive on the crumbs that fell from the table of the rich man. He was full of wounds, and the dogs licked his wounds. Thus he lived. But one day, the rich man, who thought that he would live as long as the mountains, heard a knock at the door. Who was it? Death! This is the dark visitor, who comes at an hour that we do not expect him, and seizes old and young, rich and poor, and leads them to the other world. He died, therefore. And his body became the food for worms and odor, and his soul went to Hades, where he sensed the reproaches of his conscience. And he would have preferred, as the Blessed Chrysostom says, to be stung by a scorpion, rather than experience the sting of the conscience. This he learned, when he was in the other world. Where he was, the rich man sensed a far away other place, a place of light and beauty and joy: Paradise. And he sees in the heart of Paradise, in the bosom of Abraham, whom? 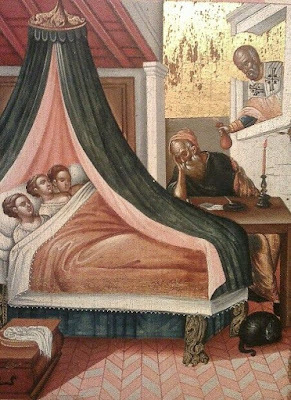 Lazarus, the poor man, together with the righteous. Then his soul cried out and said: What did I suffer, why did I believe that there was not another world? And he entreated Abraham for two things. 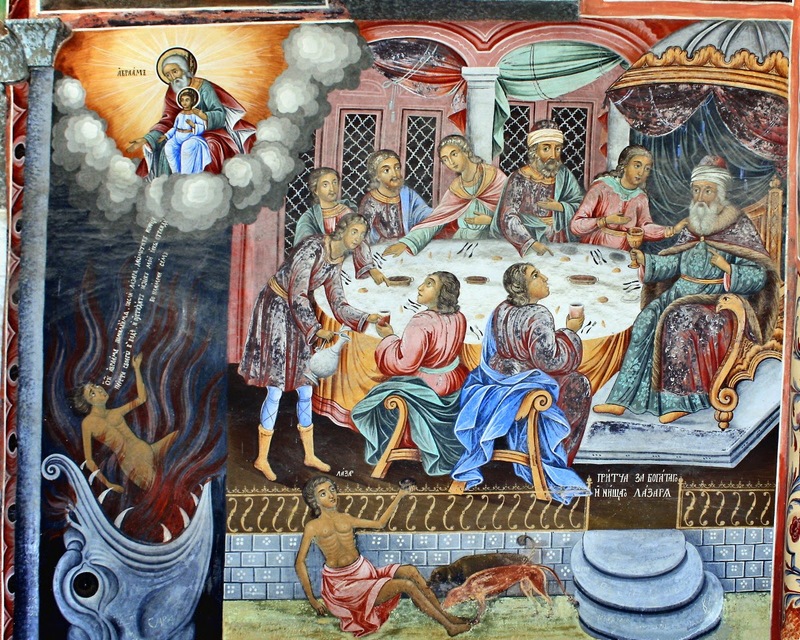 One, to send Lazarus to refresh him with one drop of water, for as he said, he was burning in that abyss. And the other, for Lazarus to go to the world below, to inform his five brothers, that they should remember their ends. But Abraham did not answer his entreaties. He said that there was a chasm between them: “between you and us there is a great chasm that was set” (Luke 16:26). There is no bridge to join the abyss with Paradise, and furthermore, there is no need for anyone to go to the world below, because they have the Scriptures, which bear witness to the other world. Thus faith in the other world is uprooted. To such, the Gospel confirms that that world exists. “And who saw it?” you might say. But have you seen America? Have you seen Australia? Have you seen Canada? Someone else told you that they exist, and you believe. If someone then told you that they did not exist, you would laugh. Thus, as surely as there is an Australia, as there are stars, as this place exists, there is surely the other life, for which man was fashioned. Who confirmed this for us? Christ Himself. And if we do not believe in Christ, who should we believe, the devil? Therefore, as it is certain—utterly certain that there is another life, what should we do? First, we should think that the souls will continue to live on there, and that there will come the day when the Lord will stand in judgment inexorably of all, and “those who have done evil” will go to the eternal abyss, but “those who have done good”, to eternal Paradise (John 5:29). You should believe this. You don’t believe this? You are not a Christian, you are a naturalist. You only speak of physical things, and that there is only matter that exists. But man, however, is not just matter. Second, we should prepare ourselves, we should be ready. We do not know the hour of our death. As the thief does not inform when he will come to break in, it is unknown when death will take us. And when it is time to travel, it is important to have prepared beforehand, and have your ticket in your pocket for when they ask it of you, for without a ticket, you are going nowhere. Our ticket is what? Faith in Christ, our good works, love, philanthropy, showing compassion, whatever is good and beautiful. Because of this, my beloved, let us close our ears to the faithless, and let us believe what our Church tells us: “I look for the resurrection of the dead, and the life of the age to come. Amen” (The Creed) Let us be ready, wherever we are, for death, that we might go to the other world, where are the saints and the angels, and where is Christ, the King of the Ages. Amen. 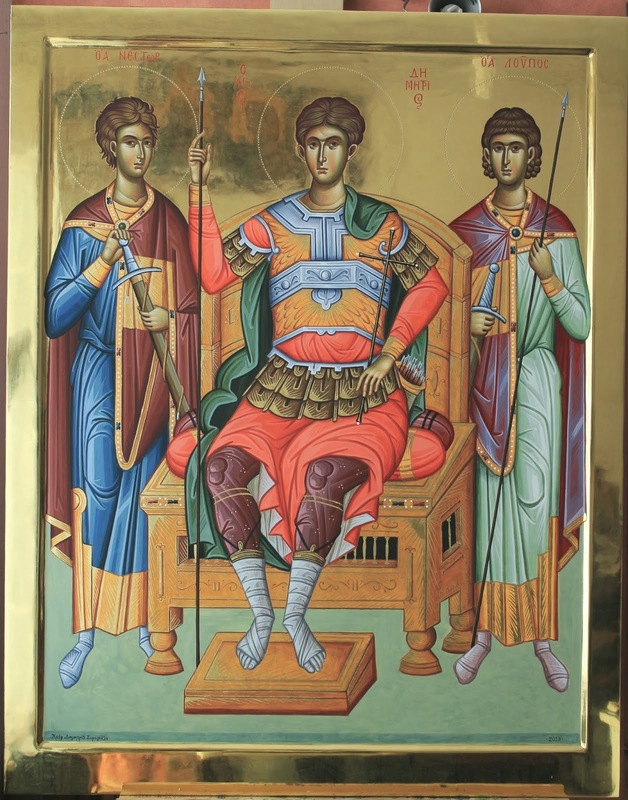 "Like He Who bore witness with a good confession before Pontius Pilate, [St. Demetrios] also gave a good confession. Learn that he was also given up to be bound. The Master received the wound in the side, and you, also received wounds in this place. He was seized and died on behalf of men, and on behalf of Him, and [his fellow] men, was he also killed. O you who are another Christ, having become an imitator of Christ! Therefore, the whole city receives boldness with reverence on behalf of the martyrdom of the Great Demetrios, and takes boast in him." Today, my beloved, is a feast and celebration. St. Luke celebrates, one of the stars which enlightens the heaven of our holy Church. Who was St. Luke? It is not sufficient to hear the name and to celebrate the memory of a Saint. We must know his life, and above all, imitate his virtues. As the holy Chrysostom said: “To celebrate a Saint is to imitate the Saint.” Because of this, let us say a few words about this Saint. Luke! And his name alone reveals something, it has meaning. The word “Luke”, as philologists say, comes from the Latin root (lux) which means “light”. From this are derived other words as well. For example, “Lyceum” [corresponding to high school in modern Greece], meaning the school that enlightens, and woe if this school does not enlighten but darkens. Lyceum=the school that enlightens, and Luke=enlightened, radiant. He, of course, was not enlightened from the start, for initially he was an idolater. He was born when everyone worshiped idols and made them gods. He was a Greek by lineage. His homeland was Antioch, that great center of Hellenism in the East. That was his life before Christ, until he believed. His calling was to be a physician (there was at that time a great medical school in Tyre). Furthermore, according to tradition, he had the talent of drawing pictures. Studying medicine, he found himself in Thebes of Viotia, and heard the Apostle Paul, came to know him, believed in Christ, was baptized a Christian, and therefore named Luke—enlightened. From then on he followed the Apostle Paul. The life of Paul, however, was not like the life of today's priests and bishops, as we partake of silence and general comfort. It was a hard life, with poverty, trials, persecutions, shipwrecks, martyrdom, the cross. How many times was he not cast out, seized, flogged, imprisoned, and stoned (by Judeans and idolaters and Roman emperors)? And ultimately he was beheaded in Rome. Throughout all of these situations, Luke did not abandon Paul. He remained near him, near him through these events, near him through his afflictions, near him through all the trials, until the end of his life. Among the fellow workers of Paul, Luke takes the greatest place, of whom he writes: “Luke, the beloved physician” (Col. 4:14). He names him “physician”, because he must have been useful to him many times, when the Apostle Paul was sick and had need of medical care. Luke did not see Christ with his eyes, but he heard of the Lord from those who were “witnesses and servants” of the apostolic preaching (Luke 1:2), and especially from the Apostle Paul. This made a great impression on him, such that he could give a faithful representation of the Lord, and of the apostles and the life of the first Church. He believed deeply, and that which he believed, he preached. And as the Apostle Paul completed his path, Luke fled from Rome. He began to travel and to preach the Gospel of Christ. 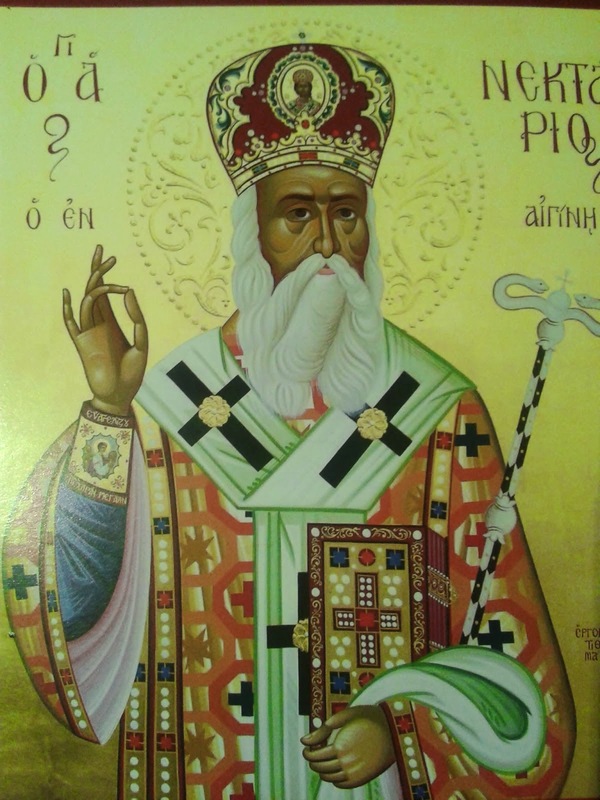 He circled throughout all of Greece, and finally, he returned to Thebes, where, according to a tradition, he became bishop, and there peacefully gave up his holy soul at the age of 80. In the Gospel of Luke is found the story of a sinful woman. She had worked orgies. She knew many men and was corrupted. The supposedly holy people in Israel, the Scribes and Pharisees, cut off communion with her, did not approach her, nor even told her a good morning. This woman one day went to Christ. He did not cast her out. He let her be, and she approached Him, knelt, sprinkled His feet with her tears and with her myrrh, and using her hair has a towel, wiped the spotless feet of the Lord. But because Christ accepted her actions, the others were scandalized. “Oh my, what is she doing? !” they said, “If he were a prophet, he would know who is touching him...” And then Christ said a great saying, which is impossible to measure, and which strikes me so deeply. Listen to what He says: “Her sins, which are many, are forgiven, for she loved much.” (Luke 7:47) In other words, the Scribes and Pharisees did not love Him, the “Learned” of that age did not love Him, the Romans did not love Him. This wretched woman loved Him, and she shed bitter tears of repentance. She sensed the redemption which Christ grants. The Gospel of Luke is the Gospel of Joy. It begins from the Annunciation of the Theotokos, with the greeting of Gabriel: “Rejoice, O Full-of-Grace...” (Luke 1:28), and proceeds with the Nativity of Christ, and the joyous angelic message: “Behold, I bring you tidings of great joy...” (Luke 2:10), and ends again with the joy of the Apostles when they saw Christ ascending to the heavens: “And they, having worshiped Him, returned to Jerusalem with great joy” (Luke 24:52). The Gospel is joy. There is no other true joy anywhere. Joy is Christ. Whoever is tried, approaches, and believes like Luke did, he will see that his sorrow becomes joy, and his darkness, light. All of us, beloved, are sick—not as much bodily as spiritually—and all of us have need of healing. Because of this, Christ founded His Church, for it to be a hospital for all men. He Himself is “The Physician of our Souls and Bodies” (Divine Liturgy), and He offers healing, medicine and therapy. His fellow workers in this healing work are the chosen men that He called, the Holy Apostles, the Holy Fathers, and the Clergy of today. Luke was a physician of bodies, who placed his scientific knowledge towards the service of every sick person in pain. However, he himself had need of a physician, the Physician of the Soul. And he found the Physician. He found him in the person of the Apostle Paul, who led him to the hospital of the Church. But the Apostle Paul, before he could offer spiritual healing to Luke, he himself had needed this, which he received walking on the road to Damascus, from our Lord Jesus Christ Himself, Who is the Physician of physicians. In other words, the Apostle Paul and the Evangelist Luke, in the Church of Christ, approached as sick men, and having been healed, with the grace of the Lord, became physicians of the others. 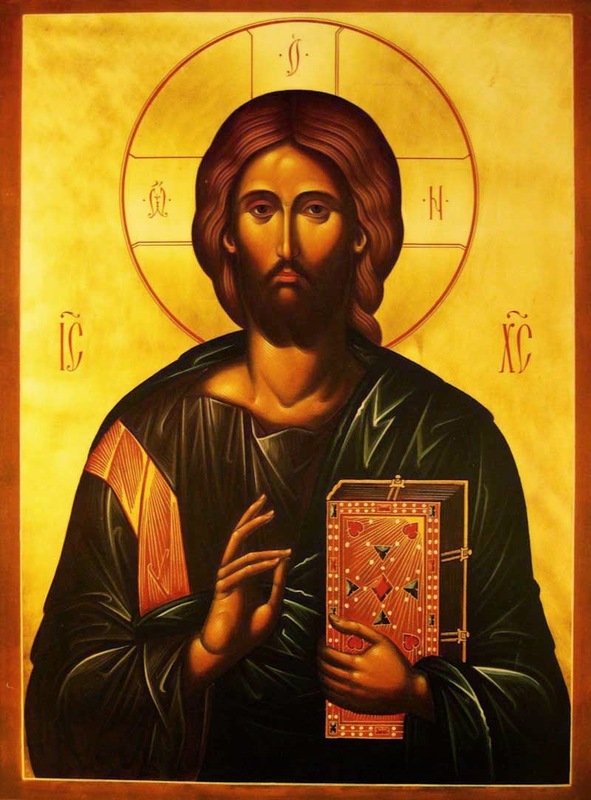 On the feast of the holy physician Luke, I now direct this towards those who share his art. My beloved physicians, nurses, and all those who serve the sick in any way! No one dishonors the worth of your sacrifice. Everyone knows this and confesses this. But I want to remind you that man is not only a body, he is also a soul. And when you offer healing and therapy to others' bodies, know that you also need healing of your souls. You have a soul that is immortal and beyond all worth; take care of it. You behold the reality daily that this life ends. Work towards your eternal healing. Imitate in this way your protector, St. Luke. Approach with faith the Physician of physicians, and the healer of the whole human existence. 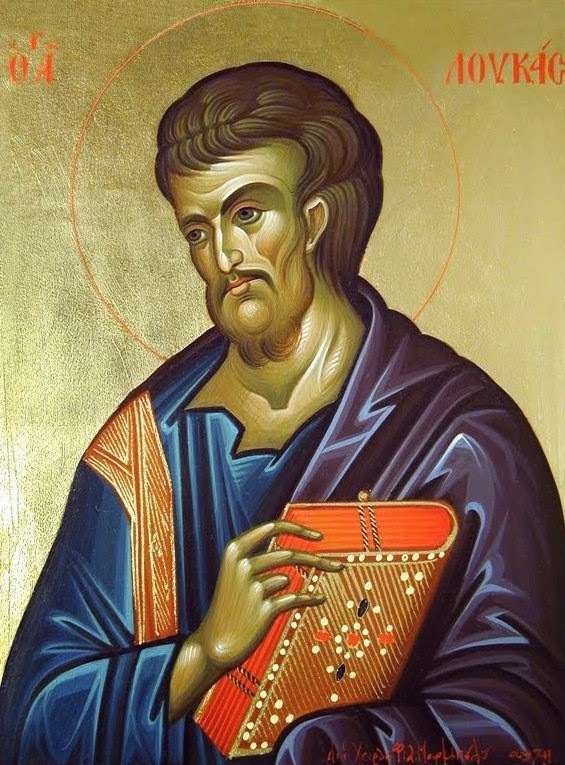 I pray that our Lord Jesus Christ, through the intercessions of the Evangelist Luke, may always be with you. Amen.